Yes folks, it's time for another Lamb Jam. We were challenged with developing our own recipe featuring lamb and other healthy ingredients. The catch: our recipe had to contain 10 ingredients or less (including lamb, but not including salt & pepper). With a bit of tweaking and taste testing, we came up with what we think is a winning recipe. Not only does it abide by the rules, but both the meat and salsa are incredibly flavorful. This dish would be perfect served with brown jasmine rice or whole grain naan. 1. Cut the leg of lamb into more manageable pieces (we suggest 8"length x 3"width x 1 1/2" height). 2. Mix all garlic, chile pepper, coriander, cumin, ginger, salt, olive oil, and lamb. If possible, marinate in the fridge overnight. If you are short on time, 15 minutes of marinating time is sufficient. 3. While the lamb is marinating, prepare your salsa. 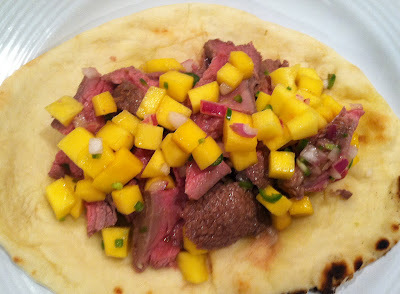 Mix mango, onion, chile pepper, salt, and lamb. Allow to marinate in the fridge or serve immediately. 4. Heat skillet over medium heat. Drizzle with olive oil. For medium-rare (internal cooking temperature of approximately 135 degrees), cook lamb on the skillet for approximately 10 minutes, turning 5 minutes into cooking time. If you prefer your lamb medium or medium-well, increase the cooking time. Allow meat to rest for 8 minutes. Slice thinly and garnish with mango salsa. If you prefer, you can also grill the meat and slice it, or serve it as kebabs. Looking for a refreshing treat that only requires ONE more ingredient? Look no further than our mango popsicles (recipe below). 1. Slice the skin off the mangos, remove the pit, and puree the flesh of the mangoes in a food processor. 2. Dissolve sugar in water (this works best when the water is over low heat). 3. Mix pureed mango, sugar water, and lime juice. Pour in a popsicle mold and store in a freezer overnight. Oh crap. You are in the same bracket as I am :) the recipe looks awesome and it has one of my faves: mangoes! I think this looks like a nice meal that could be cooked in Reading. Maybe in August. Thanks Olga! Great challenge - we are going to have to try making your recipe! Looking forward to the next supper club! Lamb is my preferred meat because i am a hearty non-vegetarian and mango salsa to it gives it a tangy blast that becomes a lovely surprise for the mouth.